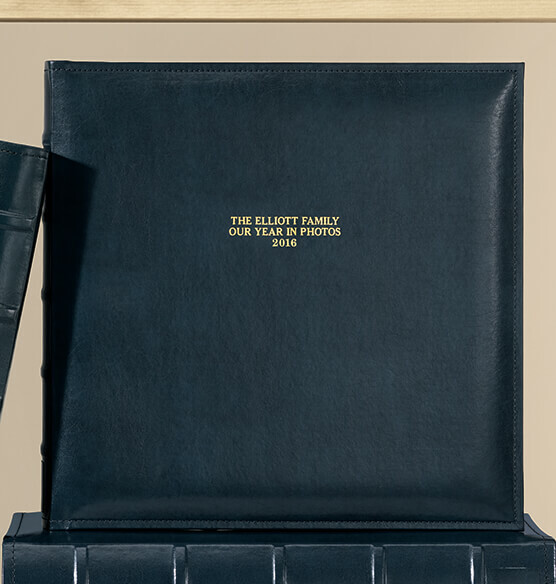 The Charter personalized memo album has a prestigious appearance and it's just the right size for storing your favorite photos. 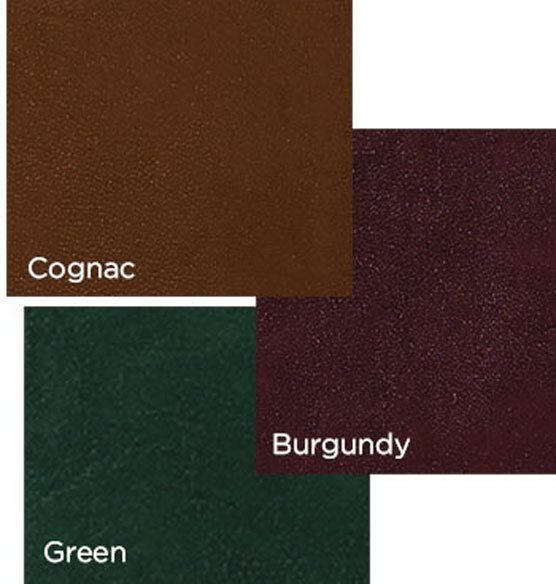 Crafted of smooth, bonded leather, you can add a family name, a date or any other unique information to the front cover. One to three lines of custom text appears in beautiful gold tooling, complementing the rich, classic color of your choice. Stitching around the edges helps give it a professional touch and a raised spine also adds visual distinction. 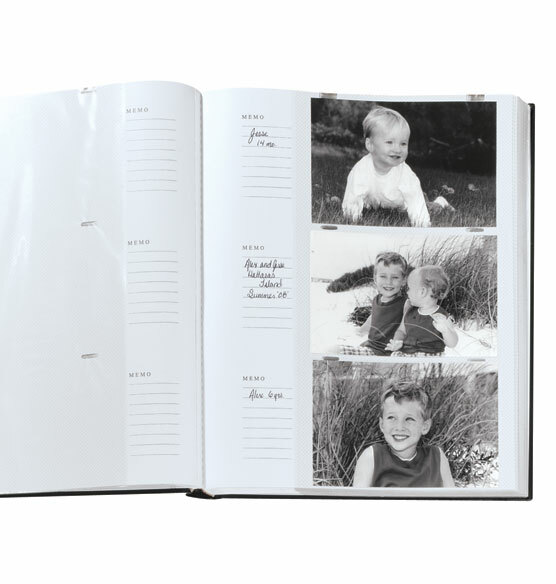 Place up to 300 photos inside and use the memo section to make notes about each one. GIVEN AS A WEDDING GIFT AND THE BRIDE AND GROOM ABSOLUTELY LOVED IT. WILL BE USED FOR ALL CASUAL PHOTOS FROM THE WEDDING. I bought this as a gift for our 2nd anniversary with custom text Ireland 2015, in anticipation of our upcoming trip. She loves the album. It is great quality, visually appealing, and I like the spaces for notes, so we can write in details that we may otherwise forget. If one of these albums is ever passed down, younger generations will be able to read the notes, that they may otherwise not have known the details. I like to use a seperate album for each child as they grow up so they can look back at how much they have grown. This album is sooo perfect and it's a great price I have 8 of them all in black and will now be using on this for all our famy photos. There are cute albums in the exposures book but I love the streamlined black and love the fact that you can add personalization to the front. Great price well made and holds up to children that love to look at the photos over and over again! Oh and it has a little memo section next to each photo. Very handy. Wish they didn't say "Memo" by every spot to write a note, but otherwise PERFECT! Beautiful albums!! I love the Memo photo albums from Exposure. Have been using them for 15 years!! I like memo album because it is simple and classic. However, they are not as durable the older classic Biblo albums that Exposures used to carry. I chose the Charter Memo Album because it looks well made and I like the bound look. The ability to use captions is a plus. This is sure to be the first of many photo albums for my son and his family. This is well built leather photo album I use for my dream vacation pictures from Europe. 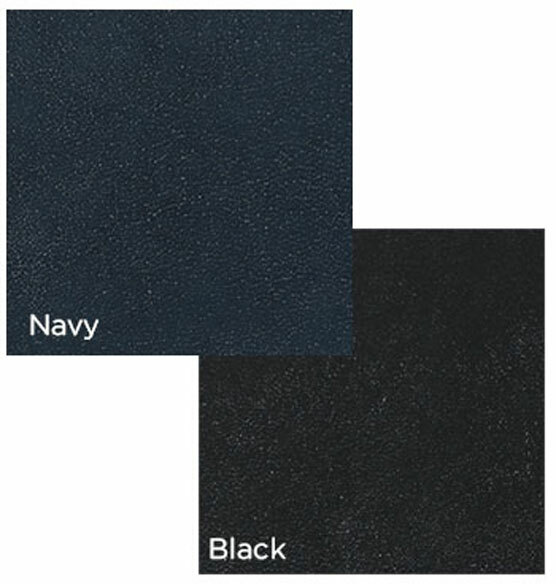 I have purchased many albums from this company over the years and has been very happy with their products. Are there photo sleeves? How are photos fixed? BEST ANSWER: Thank you for your question. This is an album with the pages already bound in side. The pages can only hold 4x6 photos. We hope this information will be of help to you. There are photo sleeves for 4x6 photos, 3 per page side. For horizontal and easily slide in for vertical pictures too. Great album. DO YOU HAVE THE BINDER IDENTIFYING LABEL? BEST ANSWER: Thank you for your question. The spine patches are no longer available. We apologize for any inconvenience. Are the pages and sleeves acid free? BEST ANSWER: Thank you for your question. The pages are all acid free. We hope this information will be of help to you. Can 4x6 pictures be put in horizontally also? BEST ANSWER: Thank you for your question. This album holds horizontal 4x6 photos only. We hope this information will be of help to you. do you have an album size that is 13.5 x 17.0 inches? Can change this album to 3x5 photos instead? I have a bunch from the early years? BEST ANSWER: Thank you for your question. This album had pages already bounded in that holds 4x6 pictures. We cannot change this. We apologize for any inconvenience. How many photos does it hold? BEST ANSWER: Thank you for your question. 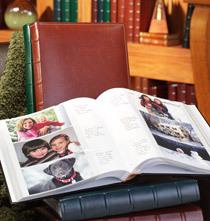 This album has 50 book bound pages and holds 3 horizontal 4" x 6" photos per side, 6 per page. This album holds a total of up to 300 photos. We hope this information will be of help to you. What size is this album? BEST ANSWER: Thank you for your question. The albums measures 10 1/2" wide by 12 3/4" high. We hope this information will be of help to you.